We pride ourselves on providing guests the best in addiction treatment, and much of this dedication can be seen in our top-of-the-line detox facility. Royal Life Centers at the Haven is a brand new facility designed to accommodate guests in all areas. We offer top of the line sleeping and eating arrangements, group therapy meeting rooms, and common areas. Additionally, we are a safe, multi-accredited facility. Fully licensed in the state of Washington and accredited by the highest authorities in the area of addiction treatment in the U.S.— Royal Life Centers at the Haven works hard to maintain its position as one of the safest, most qualified detox centers in the country. Because We Care, guests’ peace of mind is of utmost importance to us. Created as an intimate setting conducive to recovery, our facility never feels like a hospital. Each room places an emphasis on comfort, with all bedrooms, as well as common areas, equipped with flatscreen TVs. Our community common area also features an Xbox One console along with a selection of activities and games, such as ping-pong. "We are fully committed to guest health and well-being and safe, fair treatment of substance use disorders." Prepared by our chef and kitchen staff in our on-site kitchen, guests receive three delicious meals a day. 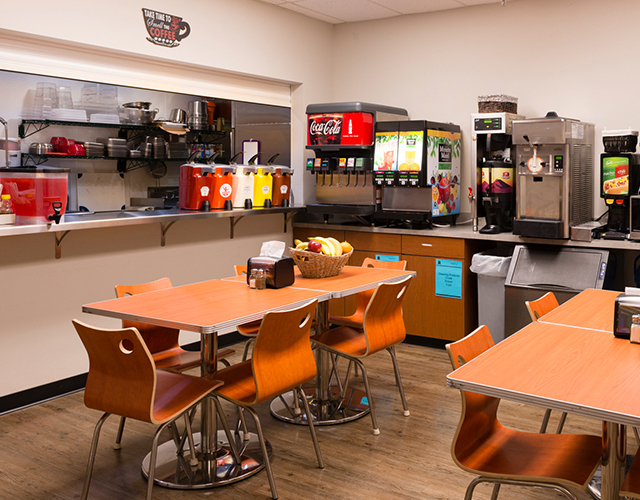 A wide selection of food and beverages, such as fruit, juice, and cereal, are always available. We only staff our facility with professionals fully committed to guest health, well-being and safety. Royal Life Centers at the Haven is the ideal place to begin the journey of recovery and build a foundation for lasting health and sobriety. Our admissions team is available 24/7 to answer any questions you may have about our facility, services, and programs. Please do not hesitate to reach out to us at (877)-RECOVERY. We also provide transportation to and from our detox facility. Our staff is here to ensure that each guest receives dignified care and treatment as an individual.